The client is a 30 year old natural product dealer, based in Switzerland. The client manufactures and distributes exclusive brands related to health and beauty, and serves as a distributor to pharmacies, health stores, therapists and eCommerce stores. The client has a network of shops around the world, and an exclusive first store in Dubai. The client wanted to create holograms of animated models in the form of lights, for use at trade shows etc., to be used in place of the actual models. 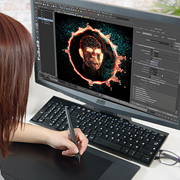 The client preferred to outsource this requirement to professional animators offshore, in an attempt to mitigate costs whilst receiving high-quality holograms. Post receiving the client's inquiry, O2I's Business Development Managers scheduled a briefing with the client. A project assessment was conducted, wherein pricing, resource requirement, and timelines were set out. The client emailed O2I high-resolution PDF files of the product models and PSD files of the product labels. We assigned four full-time animators to create the holograms using 3DS Max and Maya software. Our resources delivered the holograms within twelve business days. The process included: creating the low polygon model, unwrapping the model and applying textures, creating a virtual 3D environment, animation, adding special effects, lighting, rendering, compositing, and final output. The completed holograms were transferred back to the client via Dropbox, much to the satisfaction of the client. The client sent us an email of appreciation applauding our delivery speed, flexibility, and fast comprehension of project requirements. At Outsource2india our resources adhere to ISO quality processes. For cost-effective outsourcing solutions including Creative Services, Data Management, contact us today. Opt for our services - call or email us, tell us your requirement and get a free quote within one business day.